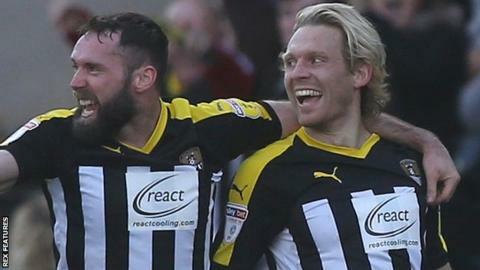 Craig Mackail-Smith's first goal since October reignited Notts County's League Two survival hopes with a battling home victory over Mansfield. The Magpies secured bragging rights over their neighbours for the first time since 2005 but remain rooted to the bottom of the Football League - despite victory over the promotion chasers. Mackail-Smith's cracking strike bagged back-to-back victories for the first time since October, with Rob Milsom's cross headed clear to the Scottish striker who volleyed into the bottom corner after 19 minutes. It was reward for a strong first half, with veteran striker Jon Stead coming close to doubling the hosts' lead before the break when he nodded Mitch Rose's cross wide. The Stags failed to test Ryan Schofield in the County net as they squandered chances, though half-time substitute Nicky Ajose almost made an immediate impact when his looping header went wide. Minutes later CJ Hamilton lashed over from Ajose's cutback as the visitors upped the pressure, while Enzio Boldewijn and Kane Hemmings both missed chances to seal the points for County.